Hi Farmer! 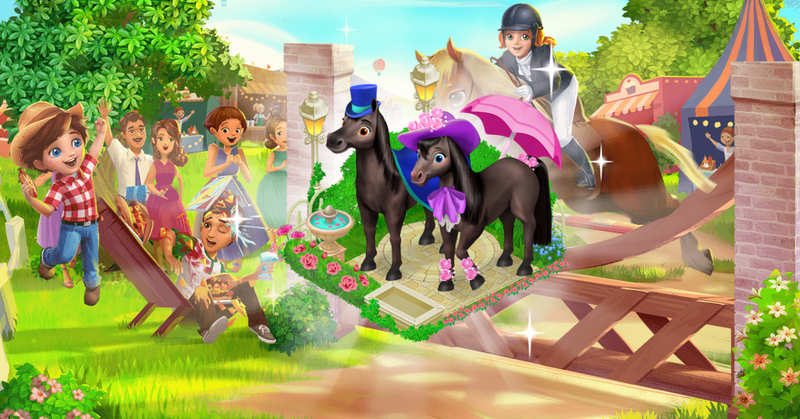 Welcome to Felicia and Fiona’s first equestrian event; Show Jumping! Me and Darryl are just finding our seats…got one for you too, c’mon!! 1. We got a TON of stuff from the concession stand; corn dogs, fried green tomatoes, fruit kebobs and mmm-mmm, my all time favourite concession food...can you guess what it is?? 3. He got beef AND chicken! Hungry lil’ guy. I’ll just yoink some of his. Hey hey! Look Felicia and Fiona are about to do their first jump…but uh-oh something’s spooked Fiona! 4. She suddenly stopped before the jump and sent Felicia flying. OH NO is she okay? We stood up and threw down our nachos to take a closer look through our bincoulars! 5. Oh PHEWF! She’s okay. Just one problem… when I stood up, I accidentally dumped all my food onto the man in front of me…even the tub of Nacho cheese sauce. Oopsies! 6. He’s very upset...perhaps I can buy him something to make up for it…maybe some dinner? Or some souvenirs? Or um, perhaps just a new shirt that ISN’T covered with Cheese sauce? 7. Nice. The man totally forgave me after I bought him a new shirt. As for Felicia, I know things didn’t go as planned but it was a good effort; flowers and champagne for all! 8. I thought Felicia would be upset but actually she’s excited to try again for the next show. We’ll totally be there to watch…but maybe without cheese sauce this time. Haha! Page generation time 0.0251 sek.